Gingivitis is the early stage of gum disease. It occurs when plaque builds up on your teeth, particularly where the gum joins the tooth. 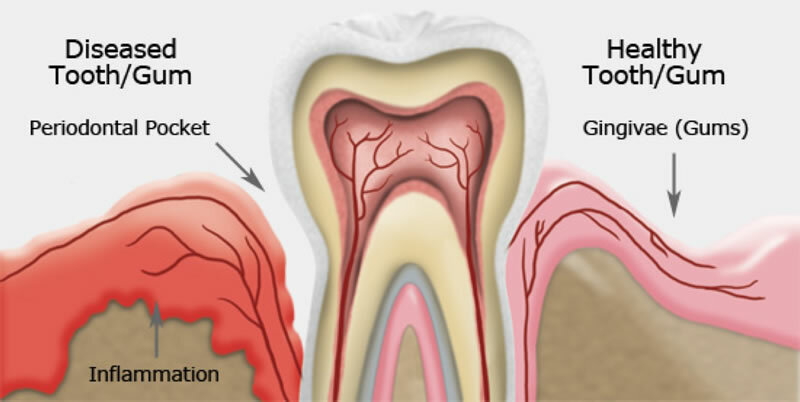 Periodontitis is the more advanced level of gum disease. Gingivitis evolves into Periodontitis if left untreated. Gum Disease Therapy will require deep cleaning of the tooth surface as well as below the gum line, where the hardened plaque and infected tissue will be removed. Depending on the severity of your gum disease and its treatment, Dr. Leung might apply an antibiotic rinse to control and ease the infection. Your gums will take some time to fully heal. If your gum disease has progressed well below the gum line, we may recommend a consultation with a periodontist who specializes in surgical gum disease therapy. For especially aggressive cases of gum disease, surgery may offer the best prognosis that allows your gum and bone to fully heal. After your Gum Disease Therapy, it is imperative to perform regular (at least twice a day) brushing and flossing to keep the plaque from building up again.